Powers/Abilities: The Clave were presumably derived from humanity at an unknown point in the future of Earth-950108. They all looked, as far as we know, identical to each other due to unrevealed reasons (possibly cloning). The composition of their large eyes and whether they possessed a variety of vision modes or not is unknown. Due to their endless war with the magic-based Kynd the Clave perfected magic-negating technology like negation fields and handheld, energy-based weapons with the power to inflict massive pain, negate magic or absorb the life force of an opponent. Traits: Though the Clave possessed free will their minds were programmed to believe in the necessity for certain things like the war with the Kynd and their speech patterns were reduced to only use necessary information, eliminating any kind of unneeded semantic, though they could switch in an instant to a speech pattern sounding more human. Due to their programming the Clave considered any lifeform connected to magic as nothing more than subjects to be studied, treating Proto-Kynd of Earth-616, as they called all magic users that were not Kynd, like lab animals, showing no regard for human lives at all. (Midnight Sons Unlimited#8 (fb) - BTS) - Originating from the alternate future of Earth-950108 the technology-based Clave were stuck in a war with the magic-based race known as the Kynd. They discovered time travel in a limited way and utilizing the Nexus of Realities in their timeline sent a mothership back into the (presumed past of their own timeline where their mothership remained cloaked from detection by the Nexus of Realities itself. (Midnight Sons Unlimited#8) - The Clave sent a contingent to the present of Earth-616 in the so-called Clave Proto-Kynd Data-Collect Mission to learn more about magic, or as they called it, the art. 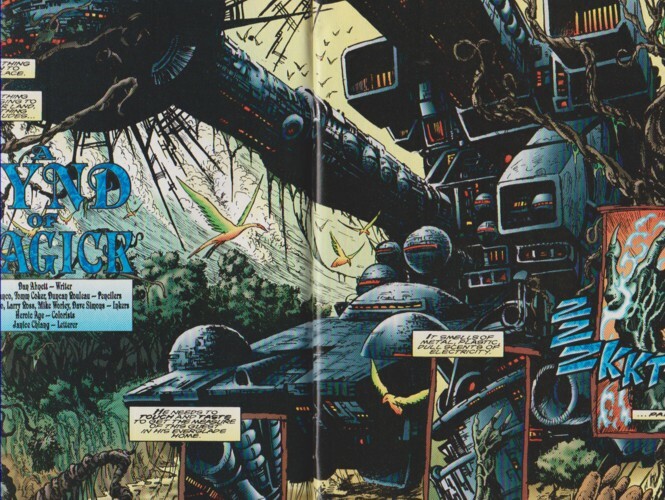 Arriving through the Nexus of Realities in the swamps near Citrusville, Florida their vessel immediately caught the attention of the Nexus' guardian the Man-Thing, who was knocked out by the ship's energy field. 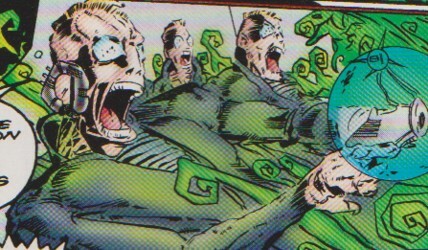 Rising from the swamp again the Man-Thing witnessed Clave's Searchware, in energy form, departing from the vessel. In their search for practitioners of the art three Searchware members were sent out from the mothership and split up to find suitable practitioners for analysis on the mothership. They individually abducted Modred the Mystic, Scarlet Witch and the creature Strange. (Midnight Sons Unlimited#8 (fb) - BTS) - For two weeks the Clave's Searchware assaulted ten small-time cults or private collectors of magic items all over the Southwest of the United States. The attacks caught Blade's attention, who began to investigate the incidents, following the culprits' trail. (Midnight Sons Unlimited#8) - Searchware Dro, Lam and Pel traveled to Garland, Florida where they entered Clem Fenny's occultist antiques store Garland Mysteries on Sarasota Street to interrogate the owner about the art. Fenny believed them to be federal agents at first, but the surprised Searchware assured him they were not feds and only wanted information on the art. When Fenny tried to expel them from his store the Searchware answered his noncompliance by continuing their interrogation with force, shooting Fenny with an energy beam. Fenny revealed his involvement with a small local cult, who dabbled in the occult. 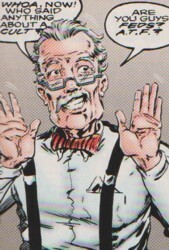 After attaining all the information he could give to them the Searchware terminated Fenny, whom they called Proto-Kynd, by draining his life force to prevent him from learning more about the art. The Searchware then stole all the mystical artifacts and books they could find in the store before leaving. Meanwhile on the Clave's vessel their prisoners Modred, Scarlet Witch and Strange awakened in a magic-negating cell. They learned from each other that they were all abducted by blue balls of electricity, which Modred surmised was highly advanced technology. Blade's investigation of the Clave's attacks led him to Garland, Florida where he posed as a FBI agent in front of the local authorities to gain access to the crime scene and learn more about the victim, revealing to the local sheriff that Fenny's life force was drained out of him and that this was the eleventh attack with the same modus operandi. He left shortly before the real FBI agent arrived on the scene. Using his Witch Compass' lead Blade journeyed into the swamp to find the murderers of Clem Fenny and the other victims. While Man-Thing observed the Clave's vessel from the outside, Modred, Scarlet Witch and Strange were finally confronted by the Clave Commandware. Strange took a shot at them immediately, but was easily overpowered by them. Commandware Beyt ordered to restrain the three magic users when they didn't comply to stand down. Beyt demanded information on the art from the trio and convinced by Scarlet Witch provided the Clave's motivation for their actions, a conflict with the magical Kynd, which could only be resolved if the Clave understood magic themselves. Modred was surprised because the Clave seemed capable to fight magic users like them with ease, but Beyt revealed that even though their mek (technology) could negate magic to some degree they were never able to capture one of the far more powerful Kynd long enough to dissect him. Modred suggested to dissect the mystical creature Strange and not him and Scarlet Witch, who were organic. Modred promised they would cooperate and answer all of the Clave's questions regarding magic. Beyt recognized the logic and ordered Aleph to remove Strange from the cell and Gamm to interrogate Modred and Scarlet Witch. In the exam bay Aleph cut into the body of the mystical creature Strange, who screamed in agony upon regaining consciousness. Outside the vessel Man-Thing felt Strange's agony and moved toward the source of the pain. Not far away from the mothership Blade finally encountered the Searchware, who were on their way back on their floating anti-gravity fields with a box filled with occult artifacts. 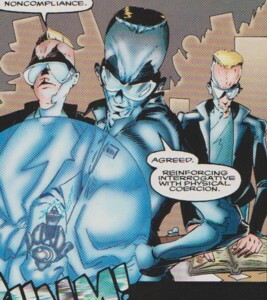 Blade quickly slew Searchware Lam and Pel before interrogating Dro, who revealed their mission to obtain life-force from Proto-Kynd and showed Blade the occult artifacts they had collected. To Blade's surprise Dro revealed the Clave originated from an alternate future of Earth and not from outer space. (Midnight Sons Unlimited#8 - BTS) - Blade threatened to kill Dro if he didn't smuggle him on board the Clave's mothership. Dro complied. Meanwhile Aleph's preliminary evaluation of Strange revealed that Strange was the progenitor of the Kynd. (Midnight Sons Unlimited#8) - On board the mothership Gamm revealed to Modred and Scarlet Witch that the Clave believed this Earth would evolve into his future timeline. Before Beyt proceeded to body scan Modred and Scarlet Witch, he was interrupted by the arrival of Aleph, who had left his post in exam bay to ask Beyt for his immediate attention regarding Aleph's findings on Strange. Modred and Scarlet Witch realized something was going on, but had no clue how to escape the negation field and take advantage of the distraction. Moments later Searchware Dro arrived without Lam and Pel. He informed Beyt that they ran into complications, which was the reason why Lam and Pel were missing. Blade jumped from the Searchware's floating box, armed with a Clave weapon and a sword. A panicked Dro explained that he was forced to bring Blade on board because his life was threatened, but only did it because he knew Commandware would be able to destroy Blade. Beyt promised to Dro he would be punished then ordered to contain Blade. Modred and Scarlet Witch realized Blade could only get on board because he was non-magical. Blade fired the Clave weapon at Beyt and Aleph, destroying the main console and fusing the systems, resulting in the shutdown of the magic-negating field. Scarlet Witch and Modred joined Blade in battle against Beyt, Aleph and Dro while Strange slew everyone in his vicinity in the exam bay when he was freed from his magic-negating restraints. Maddened by the Clave's cruel experiments on him Strange ran amok slaying all Clave in his way. Secware reported to Commandware Beyt that their weapons had no effect on Strange because he was Kynd. Beyt revealed to Modred, Scarlet Witch and Blade that Aleph's dissection of Strange uncovered Strange to be the Kynd's progenitor. Knowing this Beyt was sure they could prevent the Clave's endless war against the Kynd by destroying their progenitor now in this era. Beyt rerouted the systems to gain full negation powers to contain the organics then ordered Secware to destroy Strange, promising full negation power would be available shortly. Outside Man-Thing broke through the mothership's wall to enter the craft and find Strange, the source of the anguish he had felt. Modred, Scarlet Witch and Blade confronted Beyt to stop him from killing Strange, but he easily overpowered Modred and Scarlet Witch with a magic-negating field. Blade, who could not be contained by the field, stabbed Beyt in the chest to stop his attack on Modred and Scarlet Witch. The trio found Strange out of control on the ship and witnessed Man-Thing's arrival. Man-Thing calmed down Strange, who ordered the others to get out of the mothership. Moments after Modred, Scarlet Witch and Blade had left the mothership Strange used his vast mystical powers to collapse space-time around the Clave's mothership and explode it back to their timeline through the Nexus of Realities. Comments: Created by Dan Abnett (writer), Leonardo Manco (artist), Tom Coker & Duncan Rouleau (pencils), Larry Ross & Mike Worley (inks). Quick, fun story about a possible dystopian future and a war between technology and magic including. Screw Bendis' lackluster, overblown Age of Ultron! Give us the Age of the Clave. (Midnight Sons Unlimited#8 - BTS) - The Clave's Commandware were stationed on the Clave mothership sent back through the Nexus of Realities to the past of Earth-616. Upon arriving on Earth-616 the Commandware sent out Searchware to retrieve information on the "art", as they called magic, obtain mystic items, abduct magic users for analysis and collect life-force from Proto-Kynd. (Midnight Sons Unlimited#8) - Commandware Beyt confronted alongside Aleph, Gamm and another member their prisoners Modred, Scarlet Witch and Strange in their magic-negating cell. They tortured them with energy weapons when they didn't comply at first, but realized their mistake when Scarlet Witch made it clear that they didn't even understand what the Clave wanted from them. Commandware Beyt made it his mission to talk with their prisoners directly, explaining they were sent by their people to this era as the part of the Clave Proto-Kynd Data-Collect Mission to require full understanding of magic. Modred dug further and learned from Beyt about the war between the technology-based Clave and the magic-based Kynd. The magic negation technology the Clave used was powerful enough to deal with Proto-Kynd like Modred and Scarlet Witch, but the Clave were never able to capture a Kynd long enough to dissect it. Modred suggested to dissect Strange, who was made of pure magic, and interrogate him and Scarlet Witch, who were organic and more useful alive and intact. Beyt agreed to Modred's suggestions, ordering Aleph to take Strange to the exam bay under full negation restraint and Gamm to interrogate Modred and Scarlet Witch. While Gamm revealed to Modred and Scarlet Witch how they had traveled through the Nexus of Realities to this Earth, which presumably led to their future. Beyt was interrupted to start a body scan of Scarlet Witch and Modred when Aleph charged into the control room to reveal what he had learned about Strange during the dissection of the creature. Modred and Scarlet Witch witnessed the sudden interruption, but couldn't do anything to escape the negation field. 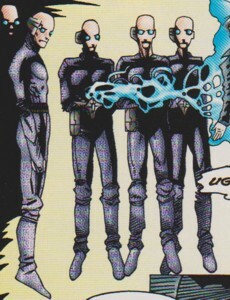 Aleph revealed that Strange was the progenitor of the Kynd. When Searchware Dro entered the room as well Beyt wanted to know where his partners Lam and Pel were. Dro told him about complications moments before said complications in the form of Blade jumped from the Searchware's flying collection box. 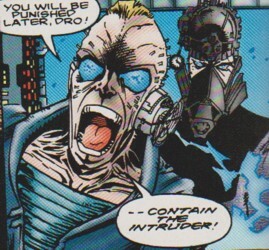 Beyt promised Dro would be punished for his actions before ordering to contain the intruder, but Blade used the Clave's own weapons against them to destroy the main consoles behind Beyt and Aleph, shutting down the negation field that had kept Modred and Scarlet Witch powerless. The duo attacked Commandware Beyt and Searchware Dro while Blade was at Aleph's throat. Meanwhile Secware was attacked by Strange, who was too powerful for them to deal with because he was Kynd. Beyt revealed to Modred, Scarlet Witch and Blade that they didn't know that Strange was the Kynd's progenitor when they caught him for analysis, but that it gave them a shot at destroying him now before their war against the Kynd ever began. Beyt fought his way through them before ordering everyone on board to destroy Strange as soon as Beyt had re-routed the damaged systems to activate full negation powers. Modred, Scarlet Witch and Blade tried to stop him, but Beyt easily contained Modred and Scarlet Witch with a negation field. Blade, who was non-magical and not affected at all, then stabbed Beyt through the chest. Commandware were on board the mothership when Strange collapsed space-time around the vessel to explode it back through the Nexus of Realities to the future. (Midnight Sons Unlimited#8) - The Clave's Searchware were stationed on the Clave mothership sent back through the Nexus of Realities to the past of Earth-616.. They were sent out to abduct magic users for analysis, which ended up being Modred the Mystic, Scarlet Witch and the creature Strange. (Midnight Sons Unlimited#8 - BTS) - For two weeks Searchware members performed ten attacks on small-time cults or private collectors of magic items throughout the Southwest of the United States. Their actions caught the attention of Blade. (Midnight Sons Unlimited#8) - Dro, Lam and Pel of the Searchware confronted Clem Fenny at his occultist antiques store in Garland, Florida. Fenny tried to throw them out of his store when they revealed they were not federal agents and had no authority to interrogate him about his connections to a local cult. Due his noncompliance they used an energy weapon to force him into revealing everything he knew about the "art", as they called magic. After learning everything they could from him they slew him by absorbing his life force with their weapon. The Searchware then stole everything occult they could find from the store, taking it with them in a flying container. On their way back to the mothership on their floating anti-gravity fields the trio was assaulted by Blade, who had found them due to his use of his Witch Compass. After slaying Lam and Pel Blade interrogated Dro, learning about the Searchware's mission to obtain information and data on magic and items, which Blade found inside a flying container. Asked about the murders Dro revealed that Commandware had ordered them to obtain life-force from Proto-Kynd as well as a source of experiential data. 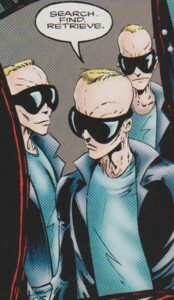 Dro ultimately revealed to surprised Blade that the Clave were not extraterrestrial, but a race from Earth's future. (Midnight Sons Unlimited#8 - BTS) - Blade forced Dro to smuggle him on board the mothership inside the flying container, which used to store magic items. (Midnight Sons Unlimited#8) - Arriving on board Dro explained to Commandware Beyt how his team had ran into complications, which resulted in the end of Lam and Pel. Blade jumped out of the box to reveal that he was the trouble Dro's team had ran into. Dro defended his actions by explaining how Blade and threatened his life and that he was sure Commandware would be able to deal with Blade anyway, but Beyt made it clear that Dro would be punished for his actions. Dro was taken out by Scarlet Witch when Blade destroyed the consoles, which shut down the negation field. Searchware were on board the mothership when Strange collapsed space-time around the vessel to explode it back through the Nexus of Realities to the future. 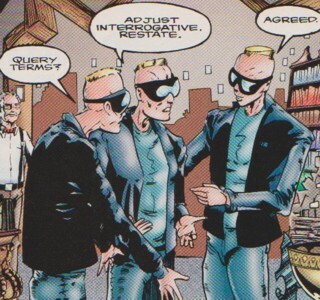 The Clave's Secware were stationed on the Clave mothership sent back through the Nexus of Realities to the past of Earth-616 as security officers. They battled Strange when he ran amok within the mothership, but couldn't contain Strange with their negator weapons despite turning them to maximum. They reported to Commandware Beyt how their weapons had no effect on Strange because Strange's power level had risen too high as he was Kynd. Secware were on board the mothership when Strange collapsed space-time around the vessel to explode it back through the Nexus of Realities to the future. The Clave sent a contingent of their kind through the Nexus of Realities in their home reality to the past of Earth-616 on a gigantic mothership, which served as their base of operations in reality-616 and was hidden from all scanners by the Nexus of Realities. It also served as prison to Scarlet Witch, Modred the Mystic and Strange and was later invaded by Blade and the Man-Thing. It was ultimately exploded through the Nexus of Realities by Strange, who collapsed space-time around the gigantic craft, seemingly forcing it back through to Earth-950108's future. (Midnight Sons Unlimited#8 (fb) - BTS) - Clem Fenny was the owner of Garland Mysteries, an occultist antiques store, in Garland, Florida. He was also a member of a local group of occult dabblers, who used to meet in a room over the local pool hall for seances and other minor occult dabbling. (Midnight Sons Unlimited#8) - In search for information on the occult the Clave Searchware confronted Fenny at his store. Mistaking them for federal agents at first he tried to throw them out of his shop when they revealed they were not federal agents and only wanted information on the "art", as they called magic. Due to his lack of compliance they physically tortured him with an energy weapon to force him to answer their questions. After revealing his involvement with a local cult he asked the Searchware who they actually were. Their reply was short and precise. They were Searchware of the Clave and Fenny was a Proto-Kynd to them and would not be allowed to learn more about the occult. A member of the Searchware used his weapon to kill Fenny by stealing his life force. The Searchware then stole everything on the occult they could find from the store. (Midnight Sons Unlimited#8 - BTS) - Blade later arrived at Fenny's store and posing as a federal agent talked with the local sheriff to learn everything they knew about Fenny and his involvement with the occult. The Kynd are a race from an undefined future on Earth-950108, who descended from the magical creature Strange, a creation of Dr. Stephen Strange. They had been at war with the technology-based Clave for an unknown amount of time, pitting their powerful magic against the constantly improving magic-negating technologies of the Clave. Though the Kynd were still too powerful for the Clave, who never even managed to capture one of them long enough to dissect. The Clave eventually sent a contingent to the past to learn more about the "art", as they called magic, to defeat the Kynd in their timeline. They traveled to the past of Earth-616, believing this era to have resulted in their future, and incidentally captured this Earth's Strange, the progenitor of the Kynd in their timeline. As soon as they realized who he was they tried to destroy him to change their future, but failed, as their weapons were ineffective against the Kynd's true ancestor. Strange collapsed space-time around the Clave's mothership to explode them back through the Nexus of Realities to their timeline.